Over 2 billion people are currently affected by water stress, a number that is expected to dramatically increase with population growth, economic development and through the effects of climate change (United Nations, 2018). Feeding the world’s growing and more affluent population will require a 25-70% increase in agricultural production by 2050 with a corresponding increase in agricultural water withdrawals, which already accounts for 70% of global freshwater demand (Ferguson et al., 2018). Therefore, appropriate irrigation data is vital for increasing the efficiency and sustainability of agricultural production. Moreover, irrigation impacts regional climate, and, hence, climate change projections for the future. However, we currently do not have enough information on the amount of water used for irrigation. Ground-based irrigation observations only exist for small areas (e.g., experimental farms) and at the regional-national scale data is obtained through surveys that are typically outdated and have high levels of uncertainty. As the demand for water is at the risk of outstripping supplies in many parts of the world, we quickly need to find an alternative approach for quantifying irrigation water use over large areas. New research shows how measurements of soil moisture from space could be used to understand how much water is used for agriculture (Brocca et al., 2018; Zaussinger et al., 2018). 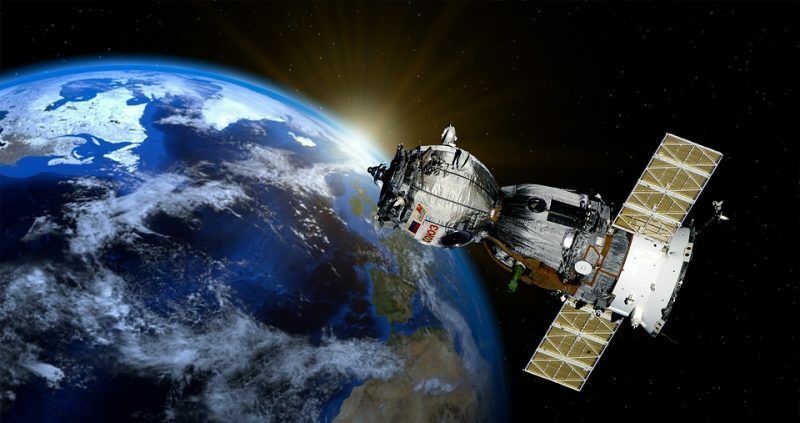 Remote sensing guarantees global coverage and repetitive measurements, thus being able to monitor agricultural lands worldwide — potentially daily. Based on the concept that satellite soil moisture products “see” irrigation, the two studies developed separate approaches for quantifying irrigation water use. Just like rainfall, irrigation causes an increase in soil moisture that is indeed detected, and measured, by satellite soil moisture observations. By inverting the satellite soil moisture signal we finally obtain quantitative estimates of irrigation water use. To demonstrate how satellite soil moisture measurements could be exploited to estimate irrigation water use, pilot sites in the U.S., Europe, Africa and Australia have been selected. We then thoroughly analysed data from four satellite missions that observe soil moisture: the SMOS mission by ESA, NASA’s Soil Moisture Active Passive mission, the Advanced Scatterometer (ASCAT) instrument on-board EUMETSAT’s MetOp mission and JAXA’s Advanced Microwave Scanning Radiometer carried by NASA’s Aqua mission. The method is found to work well in regions characterized by prolonged periods without rainfall, thus being able to quantify irrigation water use at monthly time scale for the period 2010-2017. These findings are described in the article entitled How much water is used for irrigation? 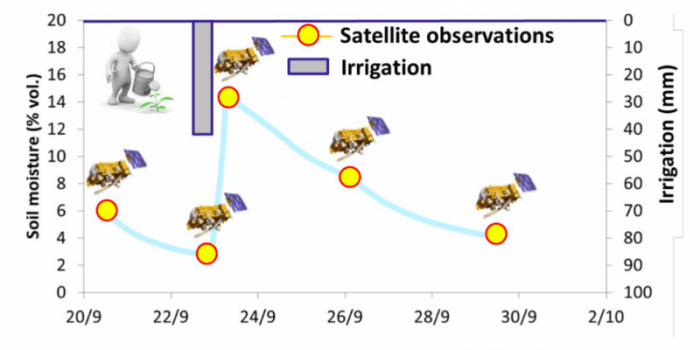 A new approach exploiting coarse resolution satellite soil moisture products, recently published in the International Journal of Applied Earth Observation and Geoinformation. This work was conducted by L. Brocca, A. Tarpanelli, and P. Filippucci from the Hydrology Group of the Research Institute for Geo-Hydrological Protection of CNR, W. Dorigo and Felix Zaussinger from the CLIMERS group of Vienna University of Technology, from A. Gruber from KU Leuven, and from D. Fernández-Prieto from European Space Agency. Luca Brocca received the M.S. degree in 2003 and the Ph.D. degree in 2008 in Civil Engineering, both with excellence, from the University of Perugia, Italy. Since 2009 he is a Researcher at CNR-IRPI. The main research interest lies in the development of innovative methods for exploiting satellite observations (soil moisture, rainfall, river discharge) for hydrological appications (floods, landslides, rainfall, droughts, irrigation, water resources management, …). He has been author of 200+ papers in peer-reviewed journals and proceedings (5000+ citations).